“Hello Gold Queen! I have a question. “On my server, I’m selling glyphs. 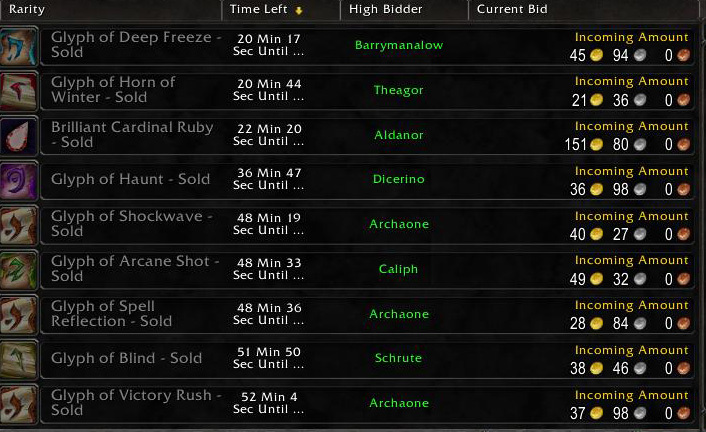 A few weeks ago, sellings glyphs was no problem. Then I started getting some serious competetion. “We made a ‘group’ (a ‘pact’ if you will) to help eachother and try to keep the glyph market in our hands. It went amazingly well. We bought out some low sellers, we bought eachother out (and refunded G) and we made a nice profit. All of us. Until this week…. 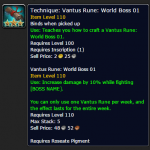 “There is 1 guy who is posting Glyphs for WAY to0 low prices (sometimes under crafting costs), just to crash the market. His response: you guys sell for way too much, I don’t like people making money of other people’s backs..
“I tried to explain him that he could also make money, if he upped his buyouts and that markets would stabilize soon enough without him. But he made it his lifegoal to get the glyph market down, because he feels it should be. As it turned out, he is a horde player, playing the AH on Alliance side… So he has no affection and care. Besides that, he feels like a Knight in shining armor, like Robin Hood, to help the poor. He already made 100k, he told me, so… he doesn’t need money. And he doesn’t care, other need money…..
“What can we do with this kind of behaviour? Any tips or something? “Hope to hear from you! 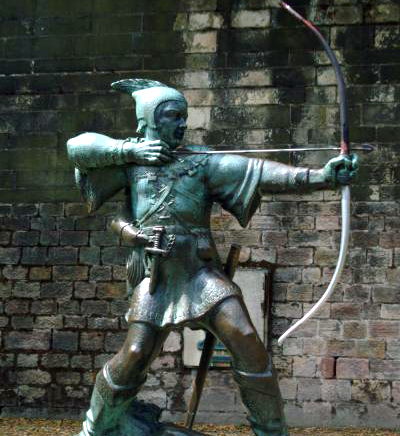 I’m so sorry to hear about your problems with this fake Robin Hood. I call him fake outright to his face, because Robin Hood never made 100,000g by selling things cheap to poor people. He doesn’t give a crap about the wallets of the buyers. He doesn’t give a crap about the wallets of his competitors. So you’re going to have to show him who’s boss. In a nice way. Number one is easy, you undercut him, hard, constantly, deep undercut him in return, and use your cartel to wall him out of the market. Glyphs cost 8g to make? Then you sell them *ALL* for 8g 01s. No one will profit here, except the customer. The goal here is to show him that you have muscle, your cartel, and you won’t take any crap, and he can either join in, or get lost. Number two, you’ve tried, and given up. How about a combination of numbers 3 and 4? Keep undercutting him, use TSM to automate your work to minimize your own boredom levels, and babysit your glyphs. Make a cartel-wide pact to always undercut him and bore him out the market. Number four means expanding into other markets, which I hope you do anyway! I want to throw this question open to the intelligent Gold Making Community of which we are a part, and ask their help, support, and opinions for your problem. Not sure I’d say “retarded” but possibly “not sure what on earth to do” would be how I would phrase it. I guess as long as he’s making a profit, and so are you, then everyone is a winner. If he is posting glyphs for as little as 1g each then just buy them up. The fact he is showing up just 2-3 times a week and posting at low prices shows he only just wants to crash the market and is not interested in the profit. Chances are he is also selling on another char and could well be also one of those good glyph sellers and is using that other undercutter alt to try and push other seller’s out and dominate the market. Its shrewd behaviour and I reckon its also going on in my server. I’m going to sound like a noob, but how do you work out that 8gold is the break even point for a glyph? To be honest with you, it really depends on the serve.r On my server I saw one glyph starting at 50 silver…I bought it out and raised the price to 50 gold. But on another server I play, that same glyph was at 100g…It depends on the server. 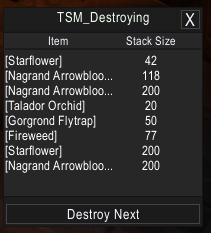 The price it costs to make a glyph depends on, well, herb prices. If herbs are 1g each, 20g per stack, that’s roughly 20g per glyph. 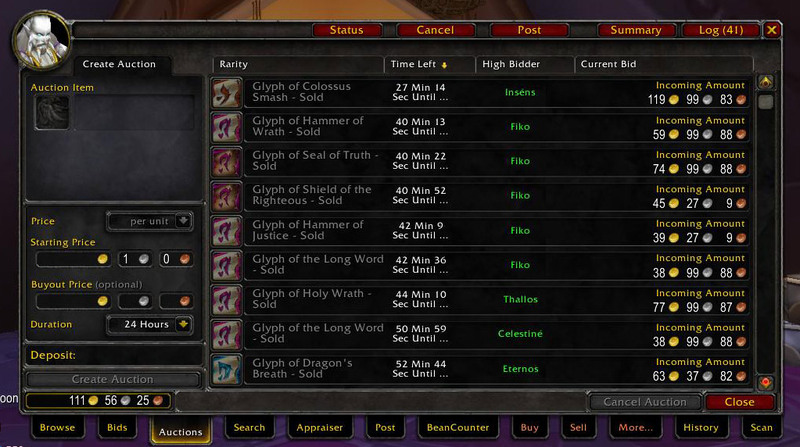 I’m sure someone can step in and give a strict price for glyphs, depending on herb prices? Anyway, I said 8g per glyph, I could have said Ng per glyph. If you sell yours for Ng+1c then he has problems undercutting and making a profit. It never ceases to amaze me to hear glyph “cartels” whine when someone wants to sell glyphs at reasonable prices. There is no other crafting market where an item is made for 5g and sold for 500g. People live in auction houses to undercut every few minutes by 1 copper so anyone that wishes to try and make a few gold with this profession are driven out. I applaud the new entrant and hope he drives all glyph pricing down to something more reasonable. In order to learn every glyph you need 72(I think, may be higher) Book of Glyph Mastery, these books cost 1000g+ (at the time I did them. So that’s 72,000 gold to learn all these glyphs, and you couldn’t just learn the glyphs that you wanted to, you learned a random glyph. 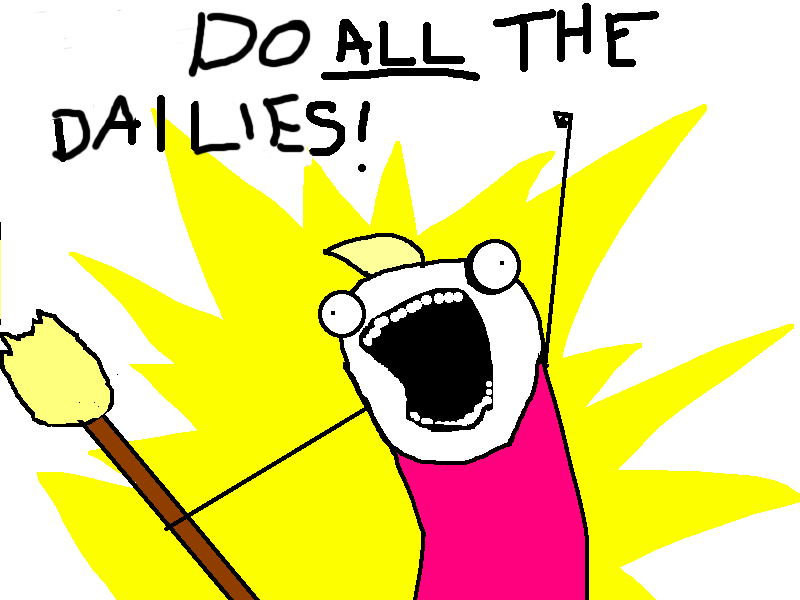 Then there is all the daily research for the minor and a few of the LK ones, and of course the cost of leveling, etc. Also there is the time involved with milling, creating inks, then making the glyphs themselves, after all “Time is money, friend”. I made a huge investment, I would like to be able to recoup some of that gold. In my main server they sell for about 200% of the crafting price. There are lots of markets where you can sell things for a lot more than they cost to gather or make. Players are paying for the time, skill, and effort to do this, not just the materials. I don’t really have a Robin Hood, but looking at the comments gave me the idea to buy all glyphs under 7g. I hate milling, then creating inks, then trading inks, then making glyphs. Thanks for the inspiration. 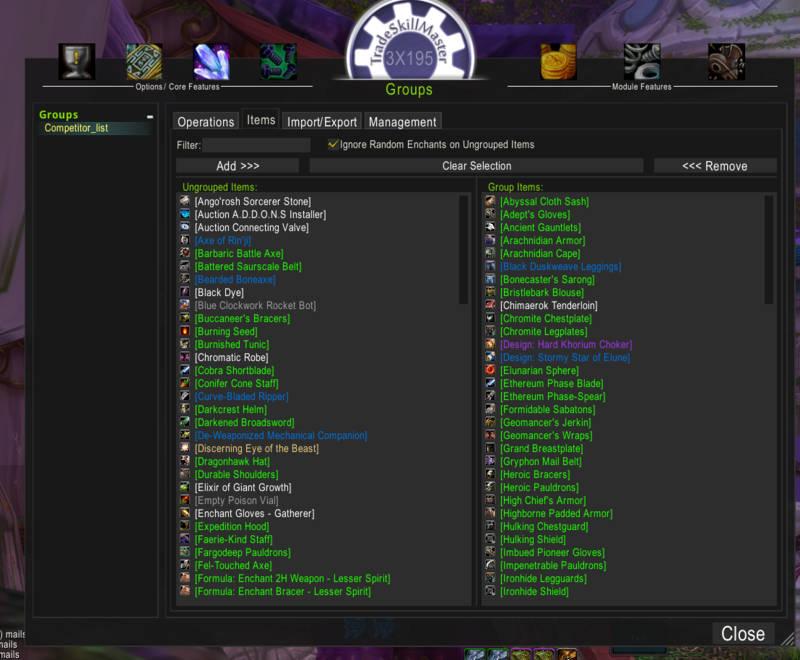 On a side note, if Blizzard were to make a new interface for milling/prospecting in mass quantities, do you think that would bring a lot more competitors to the markets? Go careful! Some of them are under 7g because they’re completely bloody useless, and the scribes needed to make them in order to level up and have then put them on the AH in a desperate bid to regain some of their gold spent on mats. Yes, reduce your prices to his level to “drive him away”. Never mind that that was his stated intention in the first place, as he believes that you’re posting your glyphs at unreasonably high prices. So yeah, reduce your prices to where you make little profit and common players can obtain their glyphs for reasonable prices. That will sure show him. It depends on his tenacity and whether he’s going to harass the glyph makers for a long time. I think it would be quite exciting to reduce all the prices temporarily and let players benefit. We’re not here about ‘showing him’ but being also allowed to play. At the moment he’s taking all the goodies for himself, and we want him to share nicely. 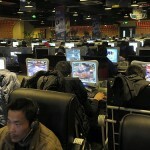 Something very similar is occurring on our server. The guy in question insists that he finds it offensive that low level characters have to part with nearly 1k to buy 3 lvl 25 glyphs. However this individual is far from the pinnacle of generosity as he claims to have a net worth of gold himself and thus has used the auction house for his own gains. This robbing hood is masquerading under the pretence of good will when his real motives is just to ruin the market for everyone else. Even if we have undercut him on any of his glyphs he never undercuts back even though he has logged on at the auction house. He only undercuts when the glyph prices have increased again! 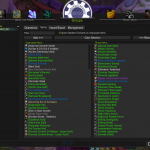 The costs of herbs on this server are increasingly high meaning very little profit can be made from a 20g glyph! At first I was worried, but now I just buy, buy, buy as many glyphs as I can to complete my stockpile. For this low price – and I have no work with milling and crafting. Find out where he lives! That’s how I “handle” my most stubborn competitors. I don’t think I’ll be undercutting you! I know this has nothing to do with the current topic at hand but I just want6 to say. I been trying to get the motorbike, it seems I always spend more money then I make..so it was hard for me to get the gold and save it, but with tgq’s tips along with some other guides she referred to, I came up with 12.5k plus enough left over to give a tip…now to start rebuilding gold, and with this guide here, glyphs should sell well! heading to wow to start selling some glyphs =) Thanks again Alysande and everyone else. 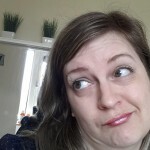 Listen to her tips and her referrals! Buy him out. He will get bored very soon and you have a nice stockpile of glyphs to sell during the next months. Long term investment, I like it. I do this all the time. I have three people who are using tsm bots for gems, meta gems, belt buckles and enchants on my server. I have every profession in game maxed so when they are on in my friends list I run the bag, epic gem and potion market. Between the three of them they will drop the market of meta gems down from 130g to 62g in a matter of hours. 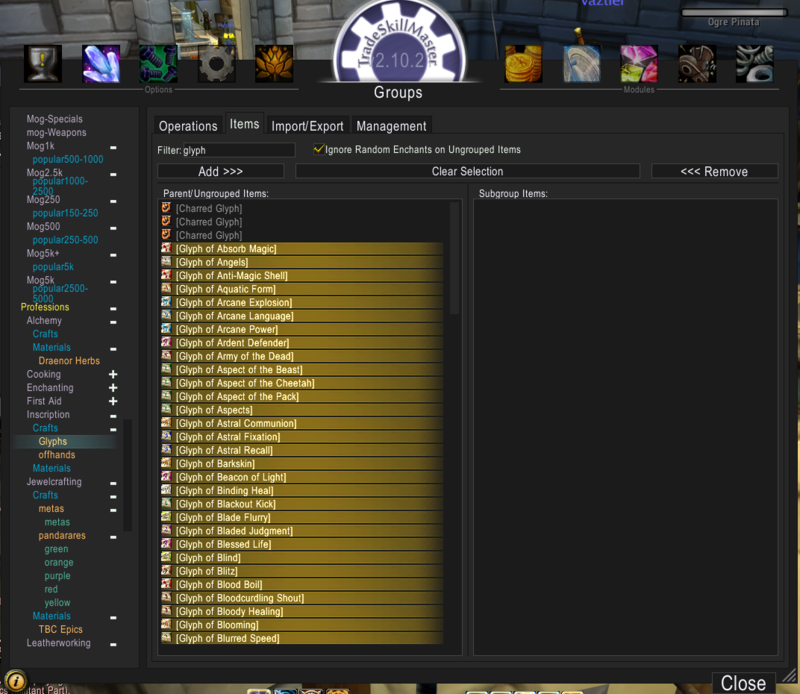 The minute they log off I buy out their items and re-list along with my own at a higher rate. The only time this doesn’t work is when one of the bots is on for three and four days straight. I agree, buy buy buy. If he is crafting at or below cost then he’s already saving you the effort of milling and creating the glyphs. He wont last, 1) he won’t be content making 0 profit for his time and 2) its not smart of him to blow away his stock this close to patch. Undercutting him or walling him at those prices and at this time I DO NOT reccomend at all. You arn’t going to make huge profits by giving your stock away. maybe i’m a noob, but how on earth do you get space enough to *store* 10k glyphs and 40k inks?? 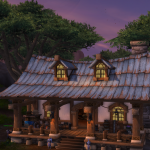 Quick answer: guild banks, personal banks, big bags, and sending mail to your alts. Two comments. This won’t last. Let him run his course and have fun. I doubt he will last a month. I would also see how low he will go. 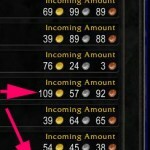 If he camps the ah see if you can get glyphs to a selling price below cost and then buy out the glyphs you want for mop. I agree with mithrildar, I’m having the same problem as the post at this right moment, so I just put up a reset scan, and well, It seems to be helping me reach my goal of having a X number of glyphs minimum, without needing to mill and craft, gotta love those robbing hoods once in a while. Buy him out. Normally I and my fellow Windtraders would tell you that you would need alot of gold to do this, because of the risk involved. But this Robin Hood couldn’t have picked a better time for you to do this. 5.0.4 (pre-patch to MoP) will be on the live servers in less than 2 weeks. 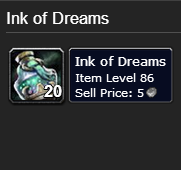 This patch will switch out the current ink trader with one that doesn’t accept Blackfallow Ink anymore and instead wants the new MoP ink. This means that after this point anyone who hasn’t stockpiled and traded inks before that won’t be able to craft any glyphs and prices will skyrocket as people demand vanity glyphs they never had before. 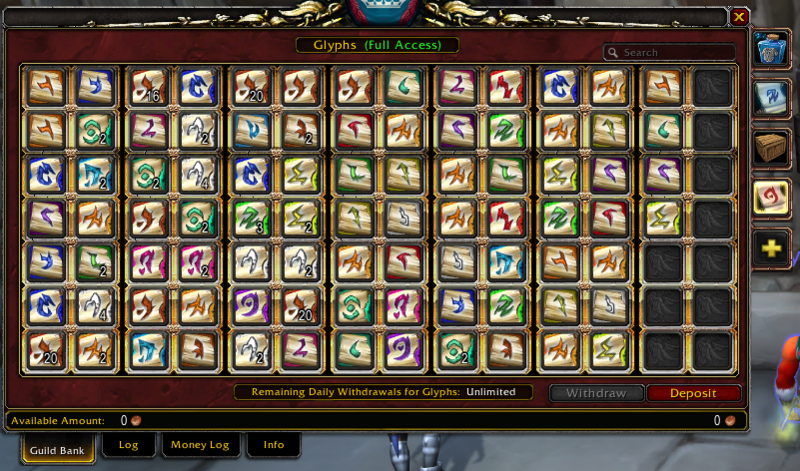 If you decide to buy him out, you can sell these glyphs for in the 100g region in 2-3 weeks. I would say this robin hood is a blessing in disguise, someone that does all the crafting for you at minimal fees, someone that helps you get your stock for once the ink traders get removed. If he’s posting under crafting costs, why not buy him out? If he’s not a native alliance player, he can’t have that much stock or gold on hand and he’d have to incur the 15% Neutral AH cut (or a $25 real life fee) to move more over. Was relieved once I read the whole thing, and saw it wasn’t me, hehe. While you can’t make 100k selling cheap in 1-2 weeks, if he keeps it up long enough, (and you do nothing to stop him), he will make some decent G. 5-10k a week is totally possible depending on the server, even at 10g/glyph profit. I second what the Queen said, and emphasize on the “take him out!” option. The longer he is able to post unmolested, the more confidante he will become. 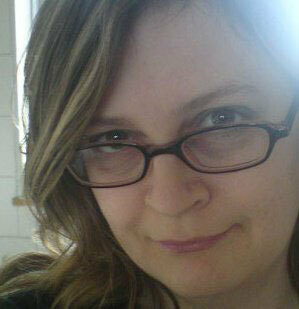 Also – if you decide to go for him, don’t tell him, don’t bait him, don’t taunt him. Anything like that will simply encourage him, and keep him interested. Don’t add him to your ignore list, as he will see, and think he’s getting to you – just ignore his whispers and don’t respond. He’ll eventually lose interest. Wow, this comment turned long. Cheers! If you have a cartel of sorts, use its buying power to buy out inexpensive herbs and inks. Relist for higher prices to reset the herb market and hence drive up his crafting costs or force him to spend his time gathering to keep it up. See how far he down he will undercut you, and post walls just above that. The idea here is to make him sell as many glyphs for as little profit as possible. See above, make him work hard and long for each of those sales. If you can, find his other markets and make them unprofitable. This may take a bit of detective work to find his alts, but skill at this gets better with practice.